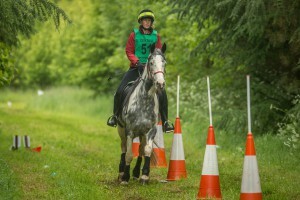 Full of anticipation for my first summer TREC season I entered National Forest in May as a Level 2 individual. My mare Inca has just turned 5 and our TREC experience is fairly limited so I hoped I wasn’t being too ambitious! The event information and competitor notes were excellent so I had no trouble finding the venue on the Friday afternoon and arrived in good time to get set up and attend the briefing. Whilst at the briefing I managed to find myself a pair to ride with which was quite a relief as the thought of doing the POR on my own on a very young horse suddenly seemed a bit daunting! 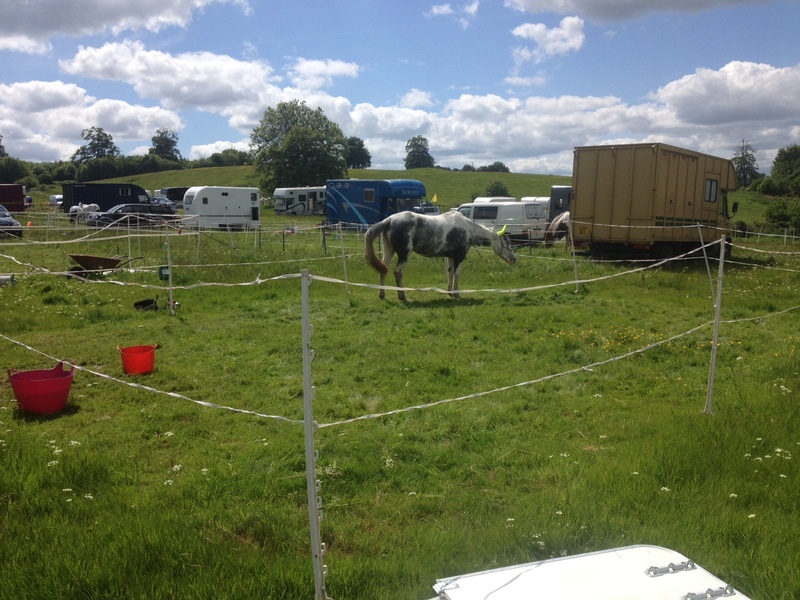 Inca took to corralling very well particularly helped by the lovely grass and I found camping in my trailer quite comfortable too! 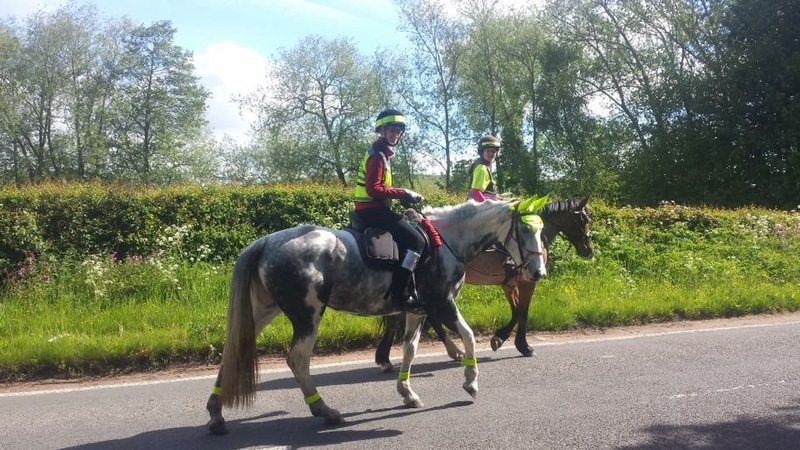 Saturday morning arrived, high vis clothing was adorned, saddle bags and compulsory items checked and off we set for the map room. Having the route spread across two maps to copy onto my one A3 sheet did throw me a bit and before we knew it the ten minutes were over. I’d managed to copy the whole route but only just! 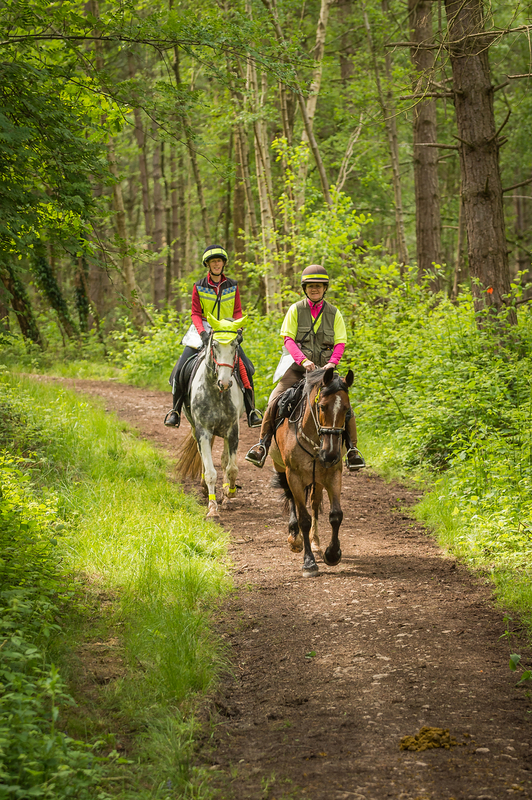 So off we set onto the POR along a route that took us through wooded tracks, fields, lanes, high areas with views of Foremark reservoir and of course forest, well it was the National Forest TREC! 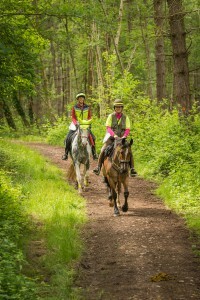 My new pair Jane and I were delighted that our horses Ruby and Inca were similar in both pace and temperament which made for a fantastic ride and we thoroughly enjoyed ourselves. There were some tricky gates along the way and an area of woodland that caught us out but overall it made for a fair and challenging POR course. I learnt a huge amount from Jane during the ride both in terms of navigating and keeping to the set speeds so it was a hugely educational experience for me. 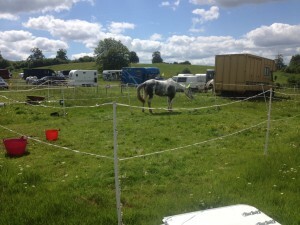 Saturday night bought heavy rain so I can’t say that I slept very much and felt very sorry for my soggy pony. It had eased off very slightly in the morning but we headed off to the MA and PTV knowing we were going to get soaked! After a quick warm up we headed over to the MA corridor which challengingly had a kink in the middle around a jump and a judge standing alongside holding a very large umbrella. Who could blame her though as it was chucking it down! I was delighted that Inca stayed in canter for the whole length of the corridor although it did require some growling on my part as we passed the umbrella. The walk is something we need to work on but on this occasion the rain seemed to help with our speed as we are normally too slow to even score! We headed straight onto the PTV and had a fantastic round with some lovely canters. There were some big challenges for Inca as she is relatively in-experienced with solid ‘cross-country’ style obstacles so I was really pleased that she popped down the step and over the small ditch with no problems. The ridden immobility proved a challenge and the solid log jump was a little too big to attempt this time but everything else she had a really good go at including the bridge and a continental U bend which we somehow managed in canter! The time limit had been increased to account for the slippery ground but although I thought I had pushed on round I still ended up with some unfortunate time penalties. Even so Jane and I were delighted to discover that overall we had come fourth out of 12 pairs! National Forest was a brilliant introduction to a TREC weekend competition for Inca and me and we both thoroughly enjoyed ourselves. It was extremely well organised and hats off to the fantastic helpers who gave up their time, particularly braving the relentless rain all day on Sunday!